﻿﻿Today, all but one of the historic dams have been removed from the river, restoring a more natural flow and passage of aquatic organisms. The Lake St. Dam still remains near the mouth, interrupting fish like salmon and steelhead on their journey upstream to spawn, while at the same time preventing the invasive sea lamprey, which has had a disastrous effect on Great Lakes fisheries, from being able to use the river as spawning grounds. Upstream of the dam, the Bear River supports a native brook trout fishery. The Bear is vegetated along almost all of its length, and wildlife frequent its banks. It is a source of pride to members of the community, who use it for paddling, fishing, whitewater kayaking, wildlife viewing, morning walks, and many other forms of recreation. 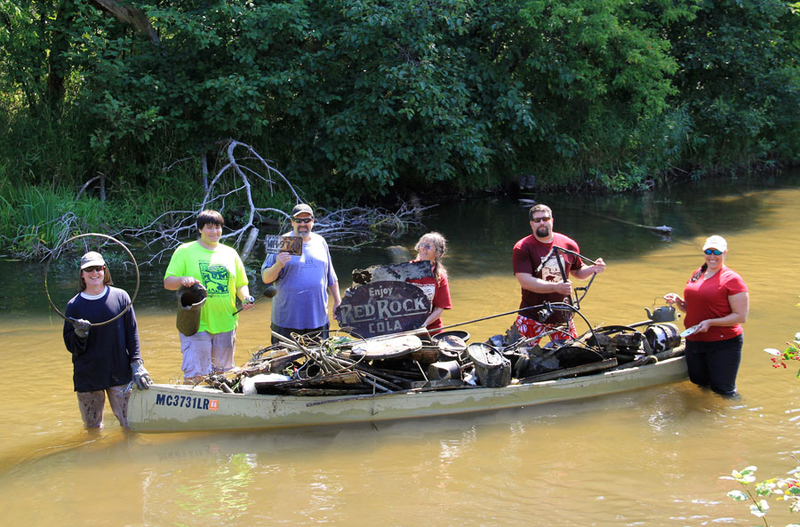 Volunteers removed a large assortment trash and other materials during the "Healing the Bear" Bear River Cleanup. The Bear River is monitored every three years through the Watershed Council’s Comprehensive Water Quality Monitoring (CWQM) Program for dissolved oxygen, specific conductivity, pH, nitrate-nitrogen, total nitrogen, total phosphorus, chloride levels, and total suspended solids. Biological monitoring is also performed by volunteers in the Bear River each spring and fall as part of the Watershed Council’s Volunteer Stream Monitoring (VSM) Program. The Little Traverse Bay Watershed Protection Plan and its Advisory Committee are working to protect the river, as it directly influences the water quality of the Bay. The Bear River Valley recreation area features steep bluffs, unpaved trails, concrete path, boardwalks, whitewater rapids, and forest areas all in the heart of the City of Petoskey. The park is, for the most part, undeveloped and is currently used for primarily passive activities including hiking, cross-country skiing, fishing, kayaking, and environmental education. Learn more about the project and why it is so important to the health of the Bear River and the Little Traverse Bay Watershed. Click here to see photos of the Bear River, both current and historic. You'll be amazed by the changes this river has seen.